We are about to embark on a brand new adventure; a new chapter in our life journey. Beginning with stepping into a new year; comes a new sense of freedom and possibility. We have learned so much this year and we are still assimilating all the powerful energies that came from those lessons. Add a busy holiday season filled with the polarities of stress and joy and it can be quite overwhelming! Know that you must take time away from all of this to allow yourself to grow and to heal. We are called back to reality by Horse medicine, that of deep instinct and wild abandon. Horse is highly intelligent and independent; you must earn her trust it is not just given away freely. Yet once you have proven yourself, you will have a special place in her heart forever. Horse needs space, she needs to run free, explore and burn off pent up energy. Horse is sensual and completely in tune with her environment and those around her, she knows right away if an opportunity should be taken or passed by. She fearlessly moves forward trusting her instinct and her deep connection to Spirit, and asks you to do the same. She encourages you to explore your own personal power. 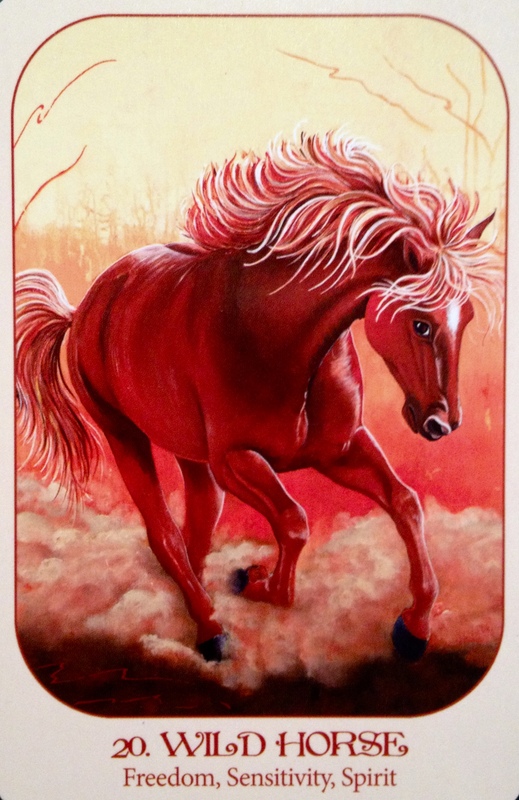 Horse reminds you that your wild inner one needs to get outside and breathe fresh air, feel the elements, embrace the Earth. This part of you must be honored in order to deepen your connection to the Universe and set your Soul free.